Sensor Information | Lake Shore Cryotronics, Inc.
A detailed explanation of the process and outcomes of our temperature sensor calibrations are contained in Appendix D: Temperature Sensor Calibrations. Temperature sensor files are delivered as a zip file containing multiple calibration files and documents. An explanation of these files can be found in the readme file. 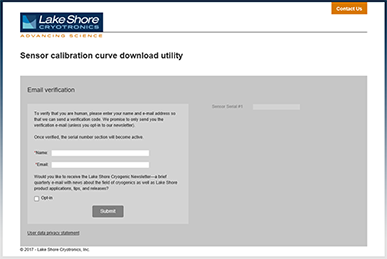 The Lake Shore Curve Handler software allows the creation, editing and loading of these calibration files onto a Lake Shore temperature controller or monitor.